Seriously, are you debating watching this show? Stop and just watch it. Actually here's a few questions to help you decide. Did you like one punch man? Have you ever dreamed about having psychic powers? Have you always wanted to see a no holds barred fight between Alakazam and Mewtwo? Do you enjoy stupid looking main characters that are humorously OP? No - Stop reading and reconsider your life choices. All I have heard about this anime is hype, hype, hype. "A new story by the same creator as One Punch Man" "It's going to be so OP!" "It's going to be the best show this season, probably this year" etc. So how good is Mob Psycho 100? Short Answer: It's pretty amazing, but I'm pissed I have to wait for season 2. The main plot starts with Reigen Arataka who claims to be an psychic who can exorcise ghosts/spirits. After we quickly learn he has no gifts whatsoever, he calls in his student Mob, real name Kageyama Shigeo, to finish a job for him. Mob is a true and powerful psychic who easily destroys the ghost Reigen was hired to exorcise. Reigen collects most of the money from the job, giving Mob a small amount in change. Mob doesn't seem bothered by this since Reigen explains that ghost was a low level spirit he could have easily handled and he's just letting Mob get experiance. However, shortly after this we see a caption titled "Progress Toward Mob's Explosion: 22%"
Mob has amazing psychic powers, but like Saitaman from One Punch Man (sorry I feel like it's impossible not to compare), few people actually recognize it. Mob's parents would like him to stop bending spoons and Mob's fellow classmates ignore him because he sleeps in class, has no athletic ability, and is socially inept. The plotline of this show goes in so many directions, espically in the early episodes. The craziness was entertaining to me becuase I never really knew what to expect. 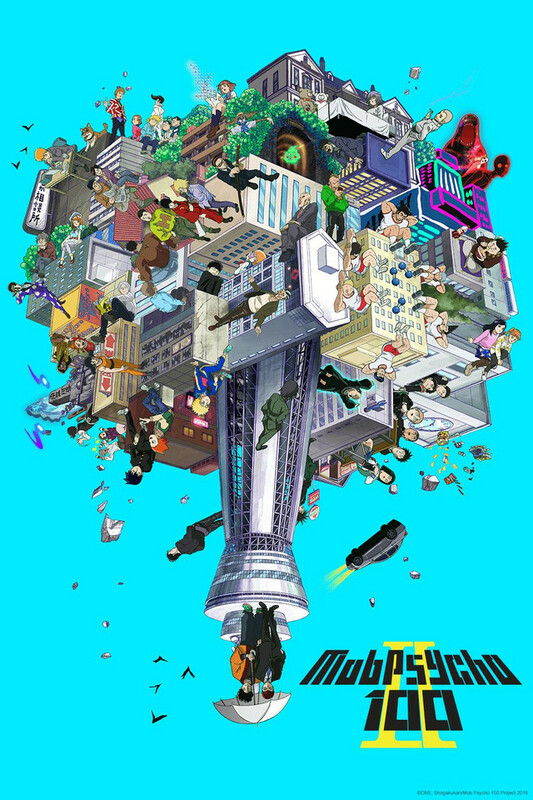 For me, all the plot twists and character twists made Mob Psycho 100 worth watching on its own, but I also have to give a shout-out to the art becuase it's amazing. One of the things that hit me immediately with this anime is the art style. You can really see One in it. One is the creator of both One Punch Man and Mob Pyscho 100, however One Punch Man was redrawn by Yusuke Murata. The anime of One Punch Man was based off Yusuke Marata's art. On the other hand Mob Pyscho 100 has always kept One as its author and artist. So, you can see One's art style much more in Mob Pyscho 100. Let's be honest; One is not the best manga artist. That said, art is in the eye of the beholder. One's art style is unique and interesting. Add in studio Bones and a good animation budget, and you get a pretty good looking anime that has a unique flare to it. I'm no expert in the musical realm but, I think the music is pretty awesome. I watch the opening every time because it's catchy and I always find something new to look at in the hypnotic visuals. Mob's psychic fight scenes have this cool borderline Indian music that sounds mysterious but also gets you amped up. *Just be be clear I'm refering to character develop as 'changes in a character over the course of the narrative' i.e. character dymanics, not expanding the veiwers knowledge of a character. This is one of the few shows I can think of where secondary characters go through dramatic changes in character (even more so than the main characters. Bad people turn good and good guys turn bad. And the reasons why they change make sense. It's another one of the aspects of Mob Psycho 100 that keeps you one your toes. Mob Psycho 100 is a comedy, but it gets a little more serious than One Punch Man. It likes to end on comedic notes, but dives into deeper psychologic issues than a pure comedy show. I found myself laughing its one-line and slap-stick style jokes, but it shines at satircal comedy. If you thought One Punch man had good comedy you'll like Mob Psycho 100. One last piece of advice: Keep watching until the very end of the second episode. The first episode is very directionless and nothing unexpected happens until the end of episode 2. Episode 3 finally dives into some cool fight scenes and they get even more intense after that. So surprisingly, it has been awhile since the end run of One Punch Man, a series that literally had every one laughing their heads off as they were cultivated by an egg headed god running around destroying enemies (with one punch of course) and creating misunderstandings everywhere. there are always going to be new shows to talk about. Madhouse has moved on to create shows like Prince of Stride, Alderamin In The Sky and in the future I think they have a show called All Out scheduled for release. Erased and Ajin came around in the Winter season, and both of those shows left a pretty good impact on the community as well. Twin Star Exorcists came out and showed everyone that Pierrot cares about all of it's works except for Naruto (although I guess the filler is pretty popular in Japan, so I guess they do care). Bones had just finished up their adaptation of Boku Hero No Academia which if you haven't seen that, please go do so it's pretty awesome. However Bones wasn't satisfied enough for the year after giving us a great show like that. No they had to take it "ONE" step further (see what I did there?) and keep the momentum rolling with the airing of Mob Psycho 100, created by the very same being who created One Punch Man. And after seeing the first episode to say I was ultra super happy would be kind of an understatement. So being already caught up to the web comic, Mob Psycho 100 definitely shows plenty of promise to build the hype train. Sure it won't do as much as One Punch Man did, but given the studio behind it, and the fact that Yoshimichi Kameda is involved (did key animation for some no name works like Evangelion 3.0, Soul Eater, FMA Brotherhood and oh yeah One Punch Man), it definitely spells great things to come out of the show. So what is Mob Psycho 100 about? Well to be pretty simple, It's about a middle school boy named Shigeo Kageyama, who just wants to live a normal life. The kicker is however, he is a super powerful esper, a being with psychic abilities. Although he would like to keep this power a secret, some people are aware of his abilities. His family knows about them, and another person named Reigen Arataka knows about them. Reigen is what you could call..... a fraud. And I'm pretty sure a lot of people who aren't familiar with the web comic aren't too fond of him from the first episode alone, but thankfully the series does build on his character, and to be honest for me, he's probably my favorite character in the entirety of the series (just like a TINY bit higher than Mob, for reasons I cannot say because then I would have to spoil it...... and no one likes spoilers (for the most part)). Anyway, Reigen runs an exorcism clinic of sorts, and although he claims he can exorcise any spirit that comes his way, he kiiinda has to call out to Mob for some help.... and by some I mean all the time, at least when the table salt solution fails (which it does). Mob does get paid, roughly a little bit more than your standard waiter / waitress an hour. So basically you could almost consider it slave labor, but apparently to Mob, he doesn't mind it so much. Another thing you may have noticed is that percentage that ticks off until Mob's explosion. Mob is basically bottling up his feelings as he goes about his daily life, but as you can see from the first episode, any time his stress builds up, the percentage meter towards his explosion does the same. As you would expect, once that meter hits 100, he loses control and well..... and explosion happens. Mob does his best to keep these powers suppressed, but there are always going to be people that will push his buttons unknowingly aware of what might happen to them. All in all I have high hopes for this series, the animation is great considering the source material (and honestly after reading it for awhile now the web comic material is actually pretty nice as well, despite what people might say about it), the music has a really cool vibe to the show, and the opening and endings get you so hype for the episode and for the next. Do I think Mob Psycho 100 is going to live up to the hype of One Punch Man? Probably not, because One Punch is a different beast. However that being said, I think the show will be great enough to stand and earn high praises on it's own when it's all said and done, rather than staying the shadow of the gargantuan that is OPM that came before it. Also for additional stuff, I had just read a conversation between the director Yuzuru Tachikawa and ONE discussing the series being adapted, I think it's pretty cool, and kind of gives you a gist of what may occur in the show in the future. ...It may be too perfect. No joke. This show so far is nearly flawless, and easily my favourite anime of the year so far. The characters are fantastic. Reigen is a personal favourite. The setting are creative, and the premise over all is phenomenal. The animation and unique production style strikes a strong contrast to the over computer animated trend swallowing anime right now. The story line just started. It really depends on how it develops to be able to determine whether this is a great anime or just a great piece of art. I can't wait to see how it progresses. I strongly suggest giving this one a shot. There are great animes, and there are masterpieces. This is better than both. Mob Psycho 100 is a showcase of the best things anime has to offer and is the epitome of great storytelling, animation, pacing, character development, comedy, and of course, ACTION. The MC is lovable. The characters are hilarious, creative, and well thought out, development-wise. The action scenes will pump adrenaline through your veins so fast, there should be a warning for addicts. This anime will make you laugh. It will make you cry. It will make you say OMG WTF ROFLCOPTER many times. Regardless of the preference one may have when it comes to genres, this show is to be watched by anyone and everyone who has ever even heard of what anime is. To do otherwise would be doing a great disservice to both the show and yourself. Awesome show, surprisingly deep... Highly Recommended! Just so we're clear, Mob is by no means a repeat of One Punch Man, though I don't think I would complain even if it was. One Punch Man and Mob Psycho are both stories about insanely powerful characters, and while OP man ends there, Mob Psycho delves much deeper. On the outside, Mob is a comedy about a lackluster middle-school student. As we grow to know Mob, we discover a child who is horrified of his own power... When he allows himself to experience the most human part of his being - his emotions - that power is swells beyond the point he can control, so he suppresses his emotions - in essence, his humanity - at all costs. Despite this complex, he is still a teenage boy who desires acceptance and confidence. Before Mob realizes it, he finds himself surrounded by a cast of endearing characters who place their confidence in him, spurring him on to discover his own potential and, in so doing, his own humanity. PLEASE, do yourself the favor of watching this show. You'll be glad you did. As a fan of the web comic, I am happy with the direction it's going in. So far, the series has done a good job of capturing the spirit of the original web comic. I am also very happy with the studio's decision to use ONE's art style for the show, as it adds a lot of character to it. Hopefully the show continues down this path. I want to see more of its witty writing, expressive art style, and delightfully hilarious story-lines. From the opening scene, to the opening theme, to the style, Mob Psycho 100 is the next great anime from the creator of "One Punch Man". Instead of heros and monsters we focus on psychics and the paranormal. What more can be said? One Punch Man was a massive success, and I see greatness here in Mob Psycho 100. On track to be great. The animation is phenomenal, the art is great, the story is intact. And while I can see the comparisons to One Punch Man coming, these are very different series, that look the same at a glance. in general, Mob Psycho is much more serious, especially since One Punch Man started as a joke manga as a test of some page layout software, whereas this is what the author originally had (and arguably still has) as his main series.